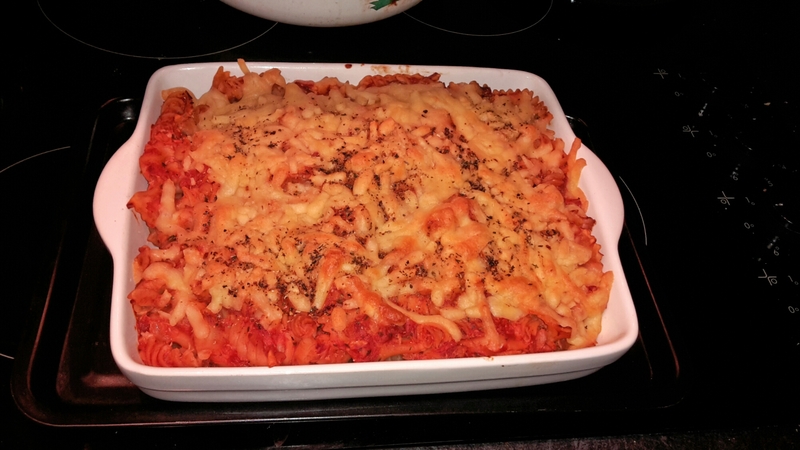 I’ve been getting back into cooking and baking lately, with dishes like lasagne, burritos, enchiladas, brownies and a Tuna and Bacon Pasta Bake. The latter was a first for me. I think having my own kitchen again helps – recently moved into a 2 bedroom flat – before that we were in a shared property… I digress. Cook the chopped bacon in a frying pan till crisp, drain the excess fat and remove from the pan. Boil pasta in a pan according to packet instructions, around 10 to 15 minutes. Drain water from pan once pasta is cooked and add the sauce, tuna, bacon and seasoning and mix thoroughly. Pour pasta, tomato and tuna mix into a small oven proof dish. And… how it turned out 🙂 I got told “it’s lovely” and really enjoyed it myself too.